The ashes of a soldier who died in Afghanistan have been sent up in a firework rocket as part of a display to mark the anniversary of his death. 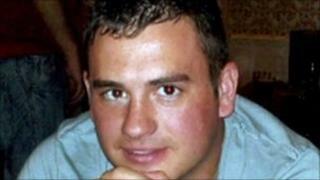 Lance Corporal David Kirkness of Morley, Leeds, died when a device carried by a suicide bomber exploded in 2009. The finale of the display was a rocket carrying some of the 24-year-old's ashes over the town. His mother Maggie Kirkness said it was the send-off her son wanted. Ms Kirkness, who has raised more than £7,500 for the charities Help for Heroes and Care for Casualties, said it was a chance to raise more funds and carry out her son's wishes. The display started at 1815 GMT on Wednesday at Scatcherd Park in the town and when the final rocket was launched the Last Post was played followed by Reveille. Ms Kirkness said: "David initially wrote a letter home saying if anything happened he wanted someone to skydive with his ashes. "But then he sent another saying he wanted to be in a firework over Morley Town Hall." Ms Kirkness said her son had a real sense of humour. "While he was writing that request he would have been creased with laughter," she added. "That's what he wanted, that's what we're doing and he'll be howling. "It's not a goodbye, it's a celebration, because we wanted to celebrate 24 fantastic years. "He was funny and so likeable, he was my rock really. "I'm so proud of him, but I'm also going to be gutted."